In front were sash bearer Ariel Bone and crown bearer Daesha Jackson. 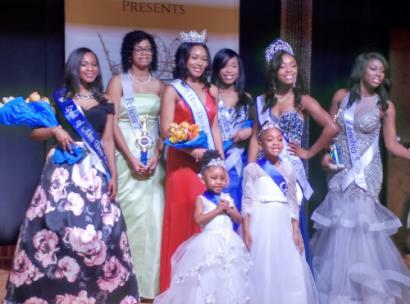 Left to right are JeLiia Pierce, Felicia Williams, Miss Bessie Smith 2019 A'nya Nelson, first runner up Kaylea Moore, Miss Bessie Smith 2018 Kaiya Moore and Zenobia Crawford. A'Nya Nelson, a junior at Center for Creative Arts, was selected as the second Miss Bessie Smith at a pageant at the Bessie Smith Hall on Saturday night. The daughter of Candace and Carl Nelson plans to go on to study mechanical engineering with a minor in music. Kaylea Moore, whose sister Kaiya Moore, was the first Miss Bessie Smith, was first runner up. She is a ninth grader at Tyner Academy. Her parents are Tyree Moore and the late Alysha Moore. Second runner up was JeLiia Pierce, a junior at Chattanooga Christian School. She is the daughter of M. Fran Pierce. Among those cheering her on was her grandfather, former City Councilman Leamon Pierce. Ms. Pierce was selected as the Spirit of Miss Bessie Smith. Other contenders were Felicia Williams, a sophomore at Brainerd High, and Zenobia Crawford, a senior at Ooltewah High. Daesha Jackson, a first grader at East Ridge Elementary, was the crown bearer. Addisyn Arie Bone was the Sash Bearer. Her great-grandfather is state Rep. Yusuf Hakeem. She is three years old and lives in Atlanta. Greg Funderburg, of NewsChannel 9, and Brianna Mason, a first grade teacher from Nashville and a pageant veteran, were the emcees. Christy Rashed is the pageant organizer and director.